If you haven’t heard of Birch Box, you absolutely have to check it out. It’s a monthly subscription service I’ve been subscribed to for a few years now. Since I now have a blog, I can share with you what I receive. Luck you! Each month, you’ll receive a selection of samples that we’ve tried (and retried) ourselves. We source our samples from both well-known brands and emerging gems. 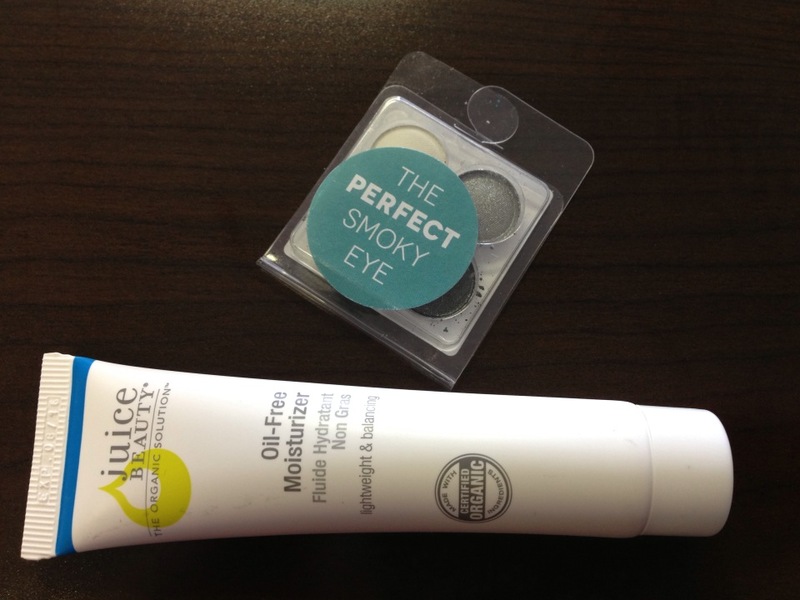 The women’s subscription includes everything from skin care to makeup, as well as fun non-beauty extras. The men’s subscription delivers top-tier grooming products in addition to lifestyle accessories ranging from hip socks to tech accessories. Check out the ever-growing list of products in our Women’s Shop and Men’s Shop. Our original content helps you get the most out of your samples. We’re a source of inspiration, advice, and information. We’ll show you how to master techniques and upgrade your daily routine with articles, expert interviews, and videos. Dive into the Birchbox Magazine and explore the The Guide. When you are ready for more of the products you sampled, you can purchase full-size versions directly from the Birchbox Shop. We have a generous loyalty program that rewards you every time you shop, refer friends, and give feedback on your monthly samples. 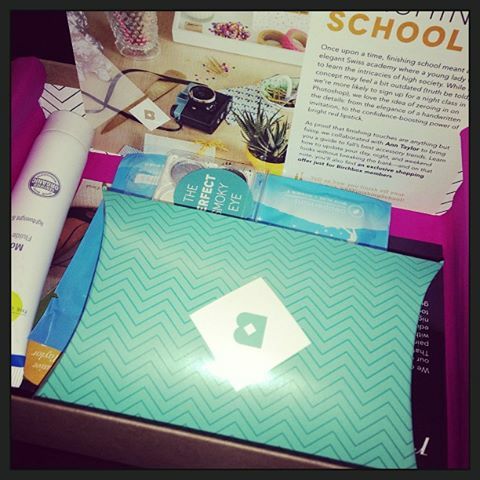 You can redeem Birchbox Points and save on any full-size or gift purchase. I chose this box based on price (only $10/mth) and rating through sites like www.mysubscriptionaddiction.com. It usually arrives around the 15th and I look forward to the surprises inside every month. This month the theme is Finishing School. I wasn’t as impressed with this month’s box as I usually am. There weren’t may samples I’ll actually use unfortunately. I’m going to throw the feet wipes in my purse because I’m sure I’ll end up using them. Perhaps at an upcoming music festival? As for the discount code, I never end up using these things. I wish that the eye-shadows had come in a more durable container as I’m not sure how well they’ll fair in my makeup case. I do like the colors though and will definitely give them a go for a night out. Since I have pretty clear skin, I probably won’t be using a moisturizer any time soon but it will be great around the season change! 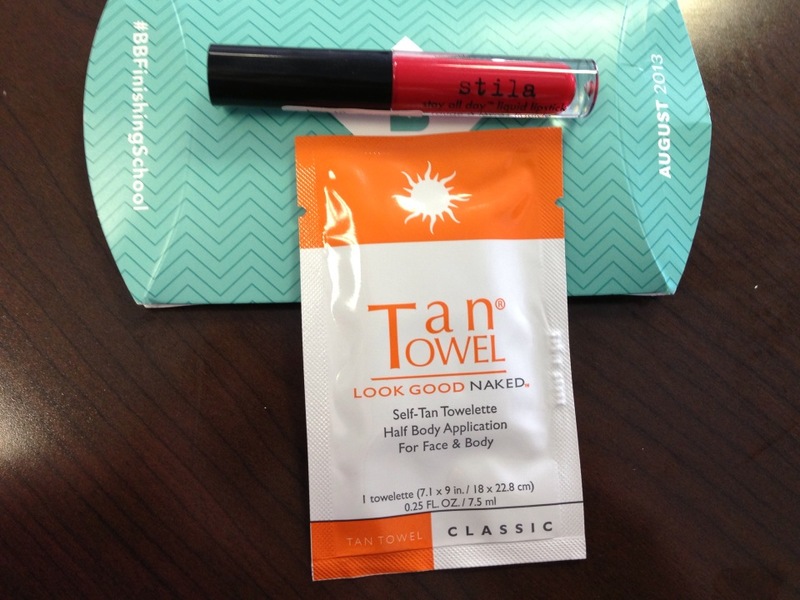 Very excited to try the stila lip color and the color looks very fun! It’s a little bit more of a fall color than I’m ready for though. I think I’ll save the tan towels for the reunion to brighten up my fair skin. As I said, not the best box I’ve received but still fun to open none the less. 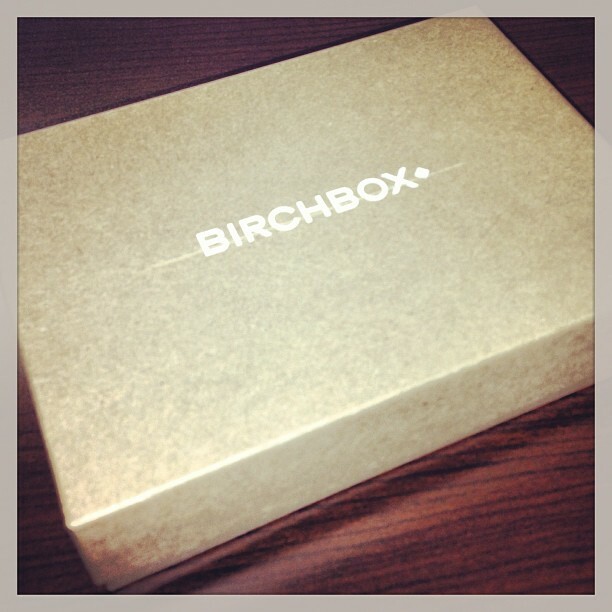 Let me know what you think of Birch Box and be sure to check out the site!